AROIC's oil based paint pens are perfect for any artist, beginner or experienced. Each of these 24 Paint markers has a medium tip and a vibrant color. The premium quality paint flows easily, dries quickly, and doesn't fade when it's exposed to water or heat. Allows you to go wild with your creations, and unleash your inner artist! On top of that, when you buy our product, we are committed to putting your happiness first. ✔THE 'FREE-FLOWING', 'QUICK-DRYING', 'NON-DRIP' paint marker of your dreams...set to revolutionize your crafting kit and switch your creativity into overdrive. ✔ARTIST QUALITY: No more paint markers that leak on your stuff, flood all over your art, dry up within days, or have jammed tips! 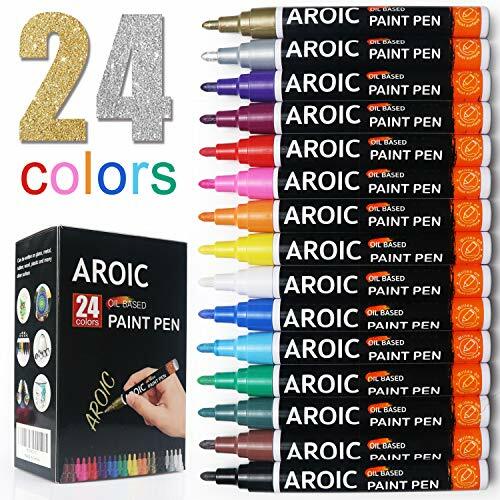 AROIC's Oil Based Medium Point Paint Pen are premium artist's quality - waterproof, weather resistant, and with a smooth flow. They're simple to use for both kids to adults - making it easy for you to seize your inner creativity, make some messes, and create vibrant art that'll catch anyone's eye. ✔WORKS ON NEARLY ALL SURFACES: Use these paint pens on almost any solid surface you can think of, including rock, canvas, wood, paper, metal, glass, ceramic, plastic, and even tire. If you're into DIY, this is especially awesome - one set of paint pens lets you create loads of projects, from rock mandalas to mug art to ornaments! ✔OUR PROMISE TO YOU: For us at AROIC, nothing makes us happier than helping people like you unlock their inner creativity - and then go wild with it.That's why, if you have any questions or run into any problems using these paint marker, don't hesitate to reach out! Either we'll give you a 100% refund, or we'll work with you till you're satisfied. If you have any questions about this product by AROIC, contact us by completing and submitting the form below. If you are looking for a specif part number, please include it with your message. Cedar Markers Gel Pens. 200 Set 100 Pens Plus 100 Refills. Color Pens with Grip. Neon, Glitter, Metallic, Pastel Colors No Duplicates. Drawing Pens for Bullet Journal.